During the Edo Period, the Japanese utilized the time keeping system called Futejiho (varying length system) in which hours are defined by seasonally changing sun 's celestial objects infestation being divided into 6 equal parts (30 degrees each). During the day time, people could tell time by the position of the sun and therefore, the system could have been convenient for the people living in the era without clocks or watches. As the length of day and night varies throughout the year, so were hours in this time keeping system, which was totally different from western 24 hours system with each hour being exactly 60mins. 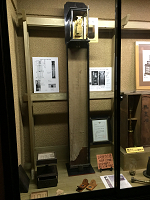 There were clocks already existed during the Edo Period and their mechanism and operation were very complicated to match Futeijiho timing keeping system. The clock exhibited at Edo Mingu Kaido is a large pillar type clock used at Kaga (current Kanazawa) feudal domain in the first half of the 19th century, a weight driven mechanical clock in which the poision of a weight indicates time with a combination of a time table. In the time table graph on its body that indicates the time, the day time and the night time for the 24 seasons of the year are precisely drawn. The clock has an error range of less than 10 seconds per day and it is quite amazing to know that there was a highly advance technology in Japan nearly 200 years ago. 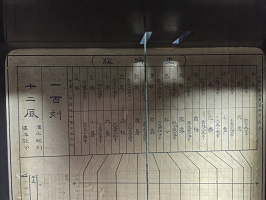 Kaga feudal domain used the clock to keep standard time and rang bells to announce time. In 1872, Japanese government introduced the western 24 hours timetable and in the Meiji Period, the domestic clocks were started to be produced by manufacturers such as Seiko. 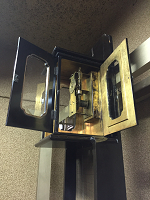 Thanks to the technologies developed during the Edo Period, they were capable in mass-producing clocks domestically.